Hampton had just 5 players able to suit up for their contest against the Timberwolves but they came to play. The Timberwolves dominated and Coach Filipi cleared the bench for this contest. Final was 59-20. The Timberwolves had no problem defeating Hampton in front of the home crowd. Final 57-27. First Grader’s at Exeter-Milligan have been learning about the states of matter in Science. They created posters that showed the definition and characteristics of the 3 states of matter; solids, liquids, and gasses. They also drew examples of each state of matter. After they created this poster they learned about how the atoms would look in each state of matter. 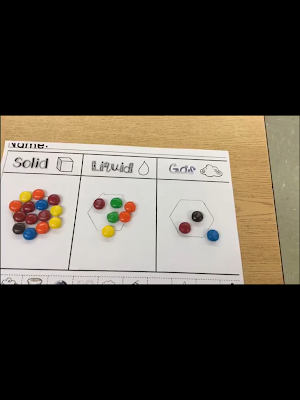 They then created an example of the atoms using M&M's. 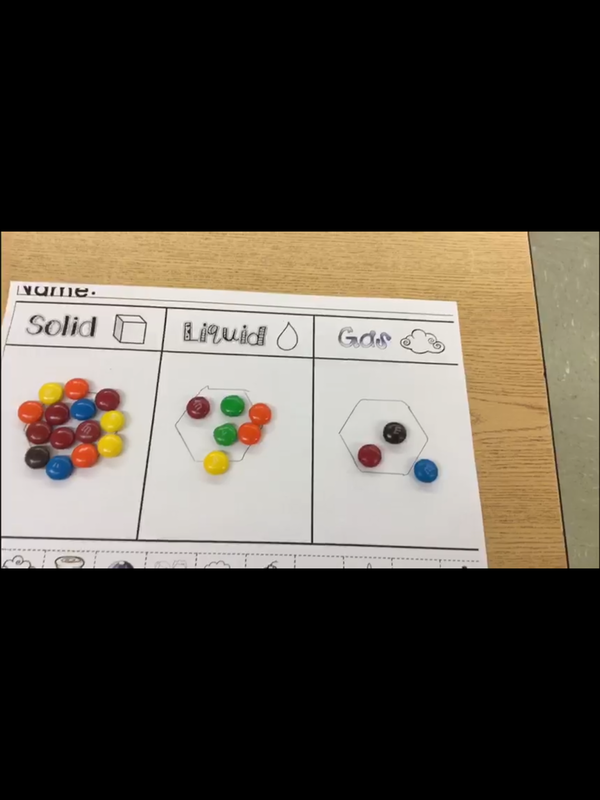 After they were finished explaining this on Seesaw, they were able to eat the M&M's. Micah Korf leads group members, Kate Pribyl and Aiden Nichols, during book club. Second graders at Exeter-Milligan truly look forward to Monthly Book Club! This book club is just like that of their parents who attend a book club. Participants meet to discuss a book that they have read and express their opinions, likes, dislikes, etc. These second graders are provided with a book and read it during their free time or at home. This month's selection was Anna, Grandpa, and the Big Storm by Margot Tomes. 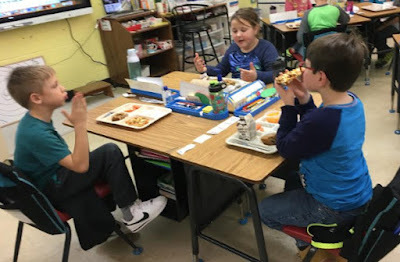 On the day of book club, students grabbed their lunch from the cafeteria and headed back to the classroom for the fun to begin. Student volunteers acted as moderators for their small group. The moderator kept the conversation going by asking group members to tell about some of their favorite parts, etc. They discussed the dangerous conditions of the blizzard of 1888 and how it affected residents of New York City. Most times book club ends with an activity or a quick video related to the story. This month, students viewed the impact the blizzard of 1888 made here in Nebraska by watching a brief video. Also this semester, each second grade student gets a chance to take a few minutes to share a story with an assigned high school junior. Having just read Anna, Grandpa, and the Big Storm, the students decided to share this same selection with their Buddy Reader. Buddy Readers plan to meet monthly with the second grade to listen to them share another story. FCDC Annual Meeting: A Taste of Fillmore County will be the theme for the 2019 FCDC Annual Meeting. Several restaurants and caterers that serve Fillmore County will be onsite offering samples from their menus and information on their businesses. FCDC Entrepreneurs of the Year and annual elections are also on the agenda. The date is February 28th at the Shickley Community Center. Doors open at 5:30 pm and the Annual Meeting begins at 6:30 pm. Please contact Susan to reserve your spot, fcdcdirector@genevamail.com or text/call 402-759-1572. 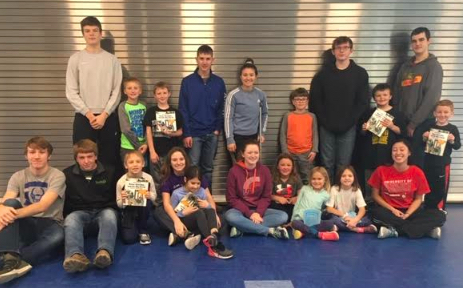 Fillmore County Foundation Grant Applications: Groups, organizations, or communities seeking funding for projects may find a source of assistance through the Fillmore County Foundation. Grant applications will be accepted through Thursday, February 28, 2019 by 4:00 p.m. You may request an application by emailing fcdcdirector@genevamail.com or by text/telephone at 402-759-1572. Applications are also available for download via the FCDC website, www.fillmorecountydevelopment.org/grants. Employment Opportunities: All FCDC 2019 Member Investors are encouraged to post their current job openings on the FCDC Website – the listings are free and are updated weekly. Simply send your information to Susan, fcdcdirector@genevamail.com. Exeter-Milligan third grade paused for a photo with their teacher Mrs. Laura Steuben (top row). Middle row from the left: Deacon Erdkamp, Levi Jurgensen, Clayton Pribyl, Wil Kallhoff, Braxton Saatmann, Titus Petersen, Richard Hickman, Kalvin Lock. Front row from the left: Madison Oliva, Brogan Staskal, Addison Foutch, Ensley Stahl, Scout Grummons and Natalie Meyer. Kaitlynn Morton is not pictured. Once a week the class heads to the library, fires up laptops and under the direction of Media Specialist Lisa Soukup spends thirty minutes learning keyboarding (typing to those who graduated before 1995). Brogan Staskal, left, and Titus Petersen are having all kinds of fun keyboarding. Media Specialist, Mrs. Lisa Soukup, helps Scout Grummons get her laptop fired up and start her keyboarding module. Exeter-Milligan’s third grade class all learning keyboarding techniques at the Milligan site library. Wil Kallhoff follows the keyboarding program. Braxton Saatmann focuses on learning the proper keyboarding methods. Exeter-Milligan Media Specialist Lisa Soukup assists Brogan Staskal at a table with Madison Oliva, (far left), Kalvin Lock (across the table) and Titus Petersen who sits next to Staskal.